Most of the technologies installed in hydropower plants all over the world are older than 30 years. This means the market for modernization, rehabilitation and capacity increase of installed hydropower equipment is growing. The modernization of existing hydropower plants allows an output increase of up to 30%. The benefit for plant operators is that the investment needed for this increase in output is relatively low, with pay-back periods often less than three years. The Service and Rehab divison is specialized in optimization of existing operations and maintenance of hydropower equipment. The division supports customers in reaching their goals - maximization of enrgy procuction yield, increase of competitiveness and generation of sustainable value. ANDRITZ HYDRO provides tailor-made solutions, a wide range of products and spare parts, as well as a large portfolio of services over the entire lifecycle of hydropower plants. A well-developed service network ensures a fast and competent response to customer needs. As a result of the long-term operation of hydro-electric power plants (HEPPs) the reliability, availability, hydraulic performance, and consequently the earnings are decreasing and the operation and maintenance (O&M) costs are increasing. When specific components of HEPPs are near the end of their service life, modernization of the entire plant becomes inevitable. Modernization is a very complex issue, and the aging of the various plant components and systems depends on evironmental and ambient conditions. 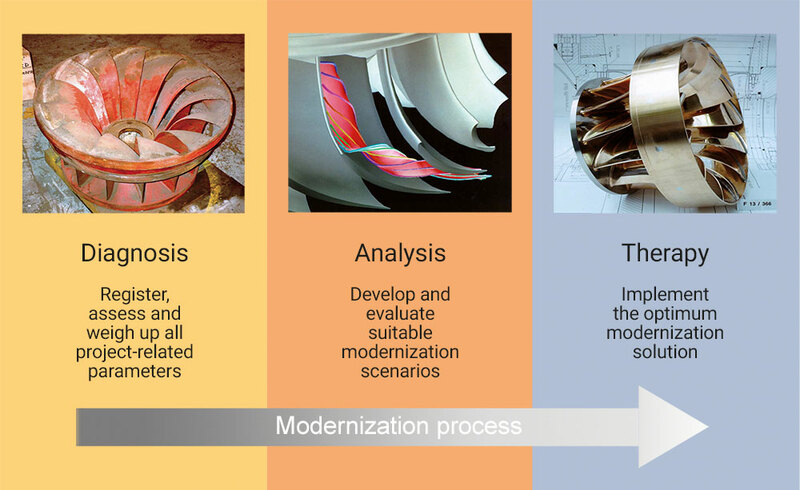 Based on many yers of experience and work, ANDRITZ HYDRO has developed a structured process for assessing and modernizing HEPPs in the most economic way. This system approach ensures tailor made solutions which guarantee the maximum benefit for the owners. Contract for the rehabilitation of turbine spherical inlet valves. Refurbishment of the world's most powerful single-phase motor generators.